Security footage of Inn Keeper and Joseph Christ haggling over the cost of using his manger. Kanipf: Joseph and Mary, thank you for coming all the way from Nazareth. How was the trip? Joseph: Carpentry isn’t paying much these days. All we could afford to rent was one mule. Need I say more? Kanipf: We appreciate the inconvenience this must be for you. Please, help yourself to the pillows on the sill behind you. I use one myself and my bottom dances in heaven all day long. Inn Keeper: Do you want to wash their feet, too? Kanipf: We’ll get down to business. As you are aware, the Inn Keeper is not satisfied with your arrangement when you stayed at his establishment during the big census. Joseph: We paid for our stay in a manger. We didn’t even have a room. Inn Keeper: There weren’t any rooms. Kanipf: It’s been established that there weren’t any rooms at the Inn. We are all in agreement with that, yes? Inn Keeper: You took advantage of my generosity. Mary: Generosity? You charged us the same number of shekels that you charged guests with a bed. Inn Keeper: Supply and demand. It was census season. I did what any inn keeper would do. What you did, you still owe me money for! Joseph: We paid our bill. Inn Keeper: You paid for two people and a mule. Mary: Are you trying to charge us for our baby Jesus? Joseph: She gave birth in straw. Straw! Inn Keeper: Exactly! Blood everywhere. Have you ever tried to clean straw? Joseph: The animals still grazed on it. Inn Keeper: Also my point. All my peaceful barn animals now have a thirst for blood. A sheep bit me! Mary: Would it have been too much to give us towels and some sheets? Inn Keeper: Had I given you linens we’d be talking about a whole other laundry fee. I should have gotten a deposit before you threw your all night party. Kanipf: The Inn Keeper is referring to your guests. Inn Keeper: There is a “no guests” rule. Mary: The Three Wise Men? We didn’t even know they were coming. Joseph: We don’t even know their names. The only thing we know is that one out of three wise men know how to give a good gift. Do you want any frankincense or myrrh? Inn Keeper: I don’t even know what those are. Samuel: I’ll take some myrrh. It’s good for your feet. I get dry, flakey heels. Smells nice, too. Kanipf: Just record the minutes, Samuel. Inn Keeper: We also had complaints about noise. Joseph: You’re kidding? As births go, Mary was miraculously quiet. Inn Keeper: One of my guests complained they heard someone banging on a drum in the middle of the night. Joseph: Oh. Right. That did happen. We didn’t know that kid, either. Who the hell bangs on a drum as a gift for a sleeping baby? Make us a card out of parchment. Mary: We were the ones who complained about the noise. You did nothing! Inn Keeper: All I know is that I rent to two people and a mule, they pay in advance, and when I go check on them at dawn, there’s three grown men and their camels crashing on the hay. Three extra humans and three camels and a baby. They had some kind of party. Pay up! 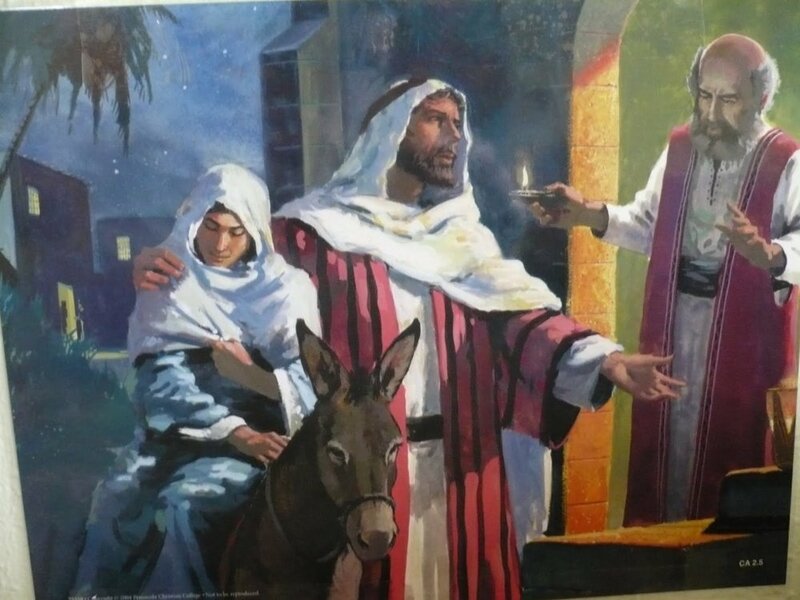 Joseph: We didn’t invite them. We didn’t even tell them where we were. Kanipf: How did they find you if you didn’t tell them where you were? Mary: They followed a bright, shining star that showed them the way. Inn Keeper: Glad to hear the money I invested in an illuminated sign is paying off. Inn Keeper: I do. They were also hanging around the complimentary continental breakfast in the morning. My wife makes the bagels from scratch. Joseph: We had nothing to do with them being there. When they showed up at the manger, we thought they were local people and we had won some “first baby of the new census” thing. Kanipf: We have better prizes for that. Leeches. Every home with a new baby needs leeches. There’s some over there in the first aid kit if you need some. Samuel, get them some leeches. Joseph: We’re good on leeches, thank you. Inn Keeper: Just give me what you owe me. 20 shekels. Mary: 20 shekels. That’s outrageous! Inn Keeper: Those wise dudes did not have a reservation. They did not even talk to me first. They ate my wife’s everything bagels and stole packets of cream cheese. I think I am being very reasonable. Mary: Can we just pay him and go? Inn Keeper: Well, what do you know? I thought carpentry wasn’t doing well. Joseph: It’s the last of the gold. The third gift from the wise men. This is what’s left after we redid the baby’s room. Samuel: Can I still get that myrrh?